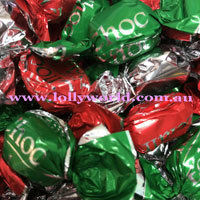 Christmas Chocolate Eclairs in red, green and silver wrapping are perfect for Christmas Day. Sweet chocolate toffee eclairs are great for that work function to create a festive atmosphere. There are roughly 180 pieces in a 1 kilo bag and 72 in a 400g bag.